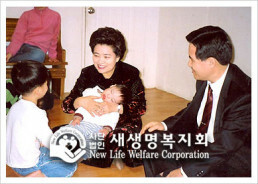 The chairwoman Zahng Gil-jah and New Life Welfare Foundation members visited the House of Hope at the Macheon-dong, Seoul, Korea. Including the chairman of the House of Hope, the staffs warmly welcomed the New Life Welfare Foundation members. The chairwoman and the members delivered the prepared daily necessities and the consolatory fund after looking around the disabled children, wishing them to have a pleasant holiday. Thinking of the children who have to spend the lonely holiday even though it is a happy gathering with loving family members for others, the members consoled them by talking with them for a short time. Being with the children who don’t lose their smile despite disability, the members had their hearts naturally warmed up. We wish the members of the House of Hope stay healthy and happy all the time in 2005.